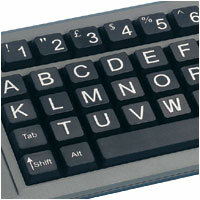 Ethel W., 81, has failing vision and uses BigKeys, a keyboard featuring one-inch keys. She found the standard QWERTY keyboard too confusing, so Microsoft brought her an enlarged ABC keyboard, which she finds more logical and easier to see. "I'm amazed at the technology," Ethel says. "It has totally changed my life."